Dice the green pepper, onion, and celery. Add green pepper, onion, and celery to dutch oven. Stir about 5 minutes, until vegetables are soft. Stir tomatoes and mixed vegetables into hamburger. Prepare the mashed potato flakes to make 3 cups. 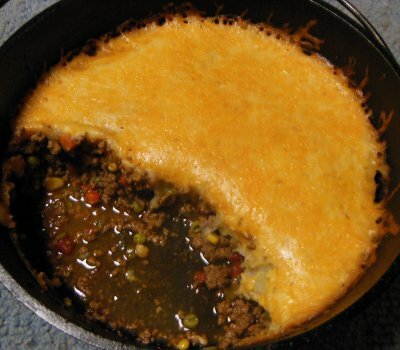 Spread mashed potatoes over top of hamburger/vegetable mix, cover it completely like a shell. Put lid on dutch oven, rearrange heat, and Bake at about 350 degrees for 30 minutes. Sprinkle cheese on potatoes and bake another 10 minutes or until cheese is melted and golden. Let me know how you enjoyed your Shepherd Pie! Excellent recipe! I played around with the spices a bit and used thyme, sage, rosemary and some cayenne. And plenty of garlic in the potatoes. In place of the frozen vegetables, I used some home grown broccoli, tomatoes, asparagus and onions. The results were spectacular! Good recipe, Dutch ... my only recommendation would be more veggies and cheese! Taco seasoning is also a good meat seasoning. Another cool twist on this recipe is to layer the browned meat and veggies with biscuits instead of mashed taters. Layer refrigerated (not frozen) biscuits on top of the browned meat and veggies, bake at 375F for about 30 minutes, take out of the oven, layer on the cheese then broil for about 12 minutes or so to brown the cheese and biscuits. @Scott - Yep, dishes like this are great for substitutions and customizations.